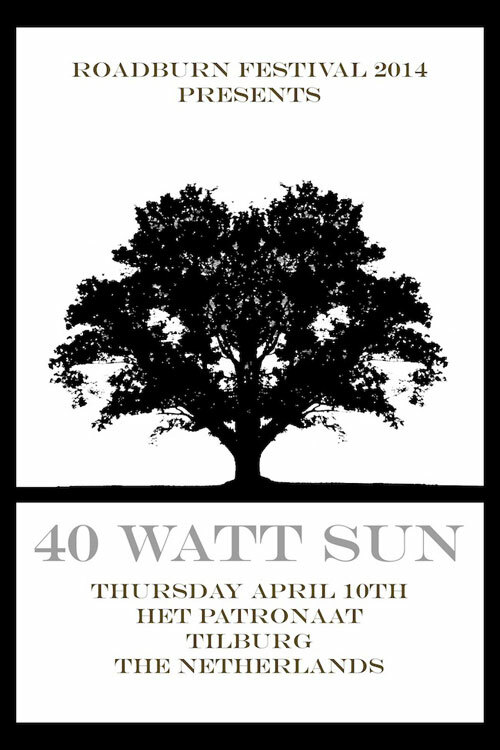 UK’s 40 Watt Sun will be making a much anticipated return to Roadburn Festival 2014 on Thursday, April 10th at Het Patronaat in Tilburg, The Netherlands. Lead by singer / guitarist Patrick Walker, 40 Watt Sun gets a chance to reprise their extraordinary 2012 Roadburn performance, this time playing a stark, stripped-back set of songs from their forthcoming second album as well as performing songs from the band’s stunning debut full-length, The Inside Room. 40 Watt Sun’s The Inside Room ranked among the very best Roadburn-related albums of 2011, and offered Walker’s distinctive melancholic voice a prominent role. His soaring and somber pipes blessed the album’s burning tracks. 40 Watt Sun‘s emotionally-charged, slowcore hybrid of Jesu meets a harder-edged Red House Painters puts the band in a class of its own. Roadburn Festival 2014 will run for four days from Thursday, April 10th to Sunday, April 13th 2014 at the 013 venue in Tilburg, The Netherlands. Roadburn Festival 2014 ticket pre-sales are in full swing! GET IN ON THE ACTION HERE! RED FANG: Online Drinking Game Now Live! GOAT Announce First European Tour!